The branding tools in Image Brander are where you can really customize your brand and save it to use in other projects, including Blog Collage. Branding Tools are available above your image in Designer View and allow you to customize the images with your specific branded style. 2. CUSTOM TEXT: This tab allows you to add text to the image. 3. FILE NAME: This will allow you to add the file name as dynamic text to the image. Once you click the Personal Logo icon, you will be given the opportunity to add new logos by clicking "Add Image". You'll be prompted to locate the logo file you want to use. Select the logo file you wish to use, then click Open. The new logo will be imported to the logo library. If you would like the background of your logo file to be transparent you will need to use a .png file with transparency. Image Brander also supports .jpg logo files. You can continue to upload more logo files or simply click the logo you want to use to create your custom style. Once you click the logo, it will be applied to your image in Designer View. 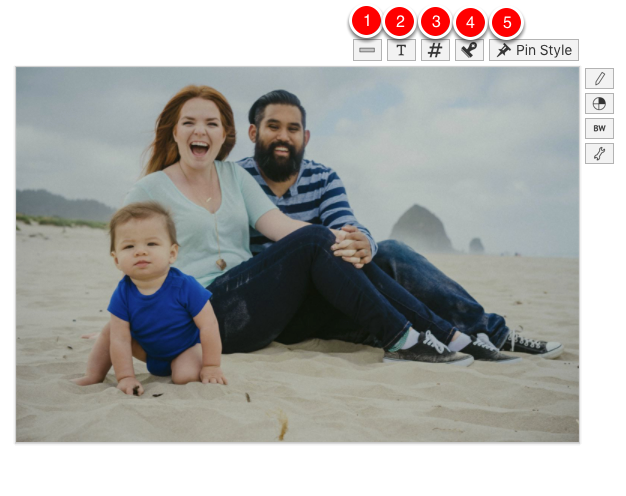 1) Once you have your brand style created the way you like it, click the Pin Style icon to save your style to use in other projects and Blog Collage. 2) Your pinned styles are saved under the Personal Styles tab. Any pinned styles have a pin icon, indicating they are a saved style. If the circle is empty, it's simply a history state indicating a previously created style that was used by not saved. You can also click the circle to toggle the pin on/off. Name your saved styles by clicking the default "Pinned Brander Style" text and changing the text. Image Brander will keep up to 20 Recent Brander Styles by default. You have an unlimited number of available Pinned Styles that you can save to your Personal Styles panel. You can delete any of these styles at any time. 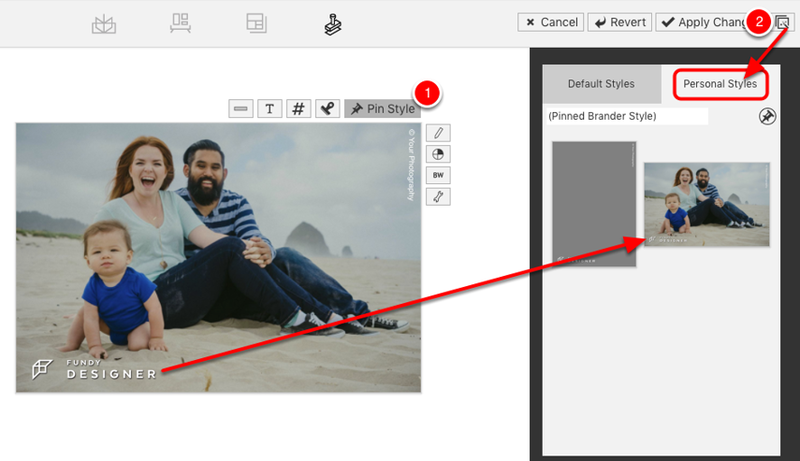 To remove an Unnamed Style, Recent Branded Style, Pinned Style or Exported Collage Style from the Personal Styles panel, right-click the name of the style and click Delete.